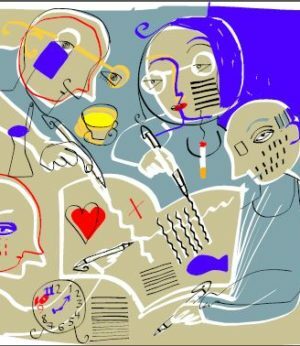 In February 2016, a number of authors, publishers and translators from the Arab world descended upon Zurich for three days of discussions, readings and workshops on all things related to Arabic literature. 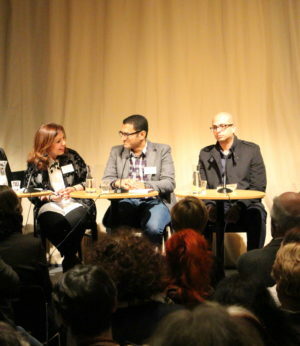 Organised by Literaturhaus Zurich in collaboration with Pro Helvetia Cairo, Days of Arabic Literature also brought Swiss literary actors to discuss with their Arab counterparts how the transformation taking place in the Arab World is impacting their literature. What depictions of society do authors develop in their novels, stories, poems? What language do they find for themselves? How do they situate themselves between newly gained freedom and increasing restrictions? These were some of the questions raised during the sessions which drew audiences by the scores. In the opening session, Ahmed Murad and Wagdy Elkomy discussed and read from their novels «Vertigo» and «Beat». They also discussed the new trends of writing at the moment. At the 1001 Tales of Translating workshop, literary translators Hartmut Fähndrich and Larissa Bender discussed the biggest challenges facing translation from Arabic to German today. Issues of censorship, funding and more were the main topic of the discussion Publishers from Egypt and Lebanon tell about their work with Sherif Bakr, Alawiyya Sobh and Karam Youssef. Syrian writers were in the spotlight in Stories from Damascus, with Ramy al-Asheq and Rosa Yassin Hassan reading from and discussing their works with the audience. The sessions also included a concert by Najat Suleiman and Hassan Taha following a presentation by Thomas Burkhalter. Tunisian Najet Adouani and Lebanese Alawiyya Sobh discussed writing as women in Women’s Voices. Jonas Luescher and his translator Ola Adel discussed his novel «Barbarian Spring» and the process of translation. The publisher was also in attendance. The sessions were very well attended and the audiences were engaged in lengthy Q&As.